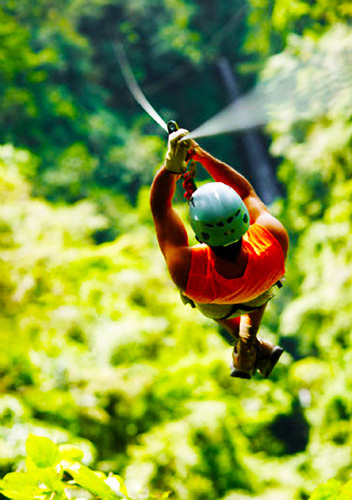 Our Zip Line Canopy Tours are reminiscent of those in the canopies of the rain forest in Costa Rica and Hawaii. A great year round program addition for ski resorts and other facilities that are located on a mountainside or have terrain features, where we can make use of the terrain to add this exciting and dynamic feature. From the moment your clients enter the course until that final zip they will be enthralled with your exciting new program offering. For ski resorts your clients can access the course by utilizing your existing lifts. The Canopy tour can have multiple stations with zip lines and more traditional or progressive challenge course elements built in. It can end and/ or begin at a rock climbing and rappelling tower where participants can do a free rappel to end their journey or continue by working on the climbing tower. It can also incorporate one of our Advanced Designs Challenge Courses. (Request our Climbing Wall and Advanced Designs Brochure for more on this). 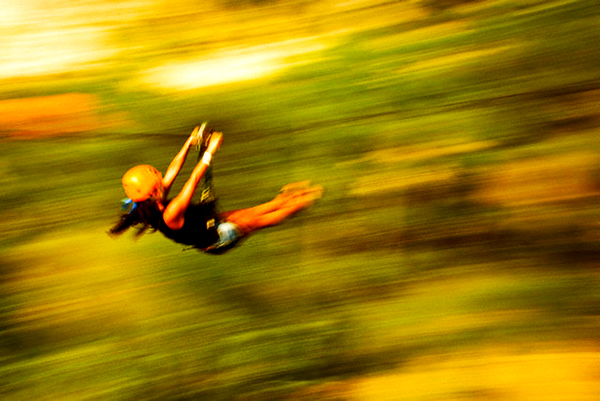 Generally a Zipline canopy Tour will incorporate a number of sky bridges and rappels as well. The exact configuration of your zipline Canopy Tour will be guided by your sites topography and a number of other factors. Please contact us to receive a complimentary consultation on the development of your Zipline Canopy Tour. You can also visit our Zipline Canopy Tour Business Development page to explore the process of Tour Development. 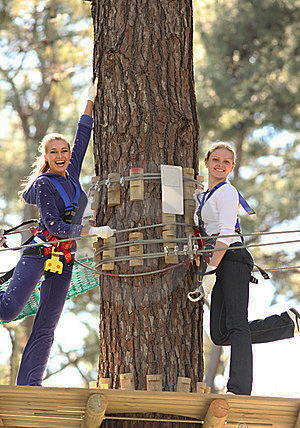 Treetop Adventure Courses (a.k.a. Adventure Parks) are a huge hit in Europe but just catching on here in the U.S.
With a treetop adventure course clients navigate for an hour to multiple hours in the trees through a series of traditional challenge course elements, more progressive obstacles and challenges and ziplines. There can be multiple levels of challenge from beginner, intermediate and advanced similar to at a ski resort. If you are considering starting a Zipline Canopy Tour or Treetop Adventure Park Operation please visit our Zipline Canopy Tour Business Development Page for more information and to schedule a consultation with the Leadership of The Summit!